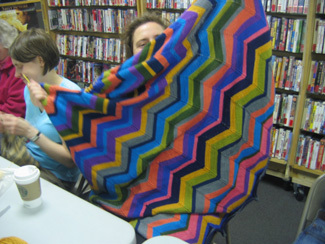 Suzanne's almost finished Circus Blanket is unbelievable! Isn't Suzanne's poncho in progress pretty? 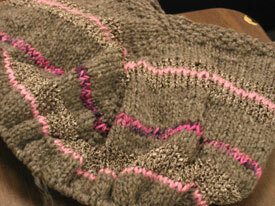 Love the pink Koigu stripes! 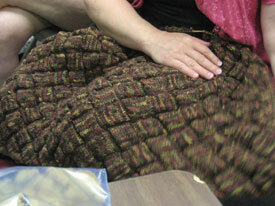 And look at the beautiful entrelac blanket she's making for her daughter. Wow! 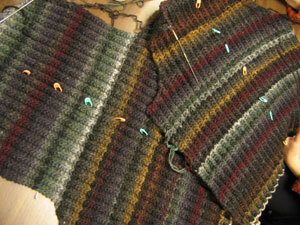 Suzanne's gorgeous Noro sweater, which she's making as a Christmas present for her husband. What great colors! 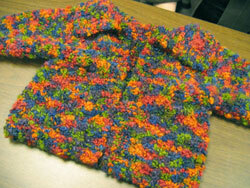 Suzanne is just finishing this adorable little jacket for her daughter. The Lion Brand Boucle yarn is really lovely. Look at those colors! 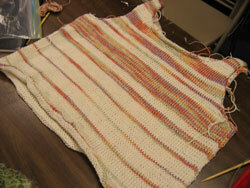 Suzanne is just finishing up this tank top with fun stripes. The stripes are based on the decimal point values of the number e (it's a logarithmic number - I don't know more than that!). But, like the Fibonacci sequence that Gina once used, it makes a lovely stripe sequence. Suzanne is cruising along on her cardi. Only the button bands left to go. Go, Suzanne! 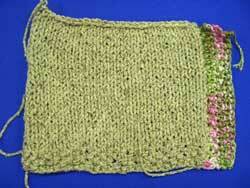 Here's a swatch that Suzanne made up for her latest project. 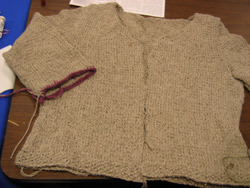 It's going to be a cardigan in a solid color with coordinating variegated yarn for the button bands. If the swatch looks this good, you know the sweater will be gorgeous!